Yunus Dehlvi was the Mirza Ghalib and Maulana Azad of Urdu magazines! We have all grown through the fragrant flairs of our childhood, one of them being our childhood mother-tongue historic magazines like, “Thakurmar Jhuli” (Bengali), “Khilauna” (Urdu), “Hans” (Marathi), “Parag” (Hindi), “Chitralekha” (Gujarati), “Chandamama” (Telugu), etc. So have I grown reading the world famed Urdu chain of magazines including, “Khilauna”, “Shama”, Bano”, “Shama”, “Mujrim”. The doyen of these magazines, Yunus Dehlvi, father of eminent author, Sadia Dehlvi, is no more. He was the Ghalib of publications and Azad of the content. Dehlvi’s efforts need to be hailed and made known to the world through the most widely circulated edition of yours as a true homage to a warrior for his mother-tongue. Started by his father, Haji Yusuf Dehlvi, Yunus ran the world’s biggest chain of these Urdu magazines from 1943 till 1994 after the family fragmented and the historic era of these publications got sacrificed at the altar of children and grandchildren’s egos. I “drank” my Urdu and learnt the language not from any madrasa, school or college but from these publications only — my treasure trove! Having known the “Shama”, “Sushma”, “Khilauna”, “Bano”, “Shabistan”, “Mujrim”, and “Doshi” publisher and the owner of once the biggest chain of Urdu magazine anywhere in the world, Yunus Dehlvi since childhood, it is the saddest blow for me that the third surviving brother after Idrees Dehlvi and Ilyas Dehlvi is no more. It is a huge loss of Urdu and the connoisseurs of the above-mentioned magazines mentioned above. On February 7, 2019, he breathed his last in the lap of his daughter Sadia Dehlvi and grandson, Ali Dehlivi, besides almost a hundred other relatives around him. He was buried at the Qaum Punjabian cemetery at Sheedipura, Karol Bagh, Delhi, in the presence of hundreds of his lovers with eyes welled in tears. He was 89 and about two years ago, he suffered from stroke. Dehlvi was member, Governing Council of the Audit Bureau of Circulations Ltd (ABC), besides being the President (1969-70) of Indian and Eastern Newspaper Society (IENS). A winner of umpteen Urdu awards round the globe, he had it, including Urdu Delhi Award, Edinburgh Urdu Circle, the John Gilchrist gold medal, Sahir Award besides a list of inexhaustible felicitations. Magazines like “Shama” and “Khilauna” used not only to sell like hot cakes but these were also sold in “black”,the moment these were sent to the vendors. Another reason for the popularity of “Shama” was its “Muamma” (literary puzzle) where words had to be filled from Urdu novels and lakhs of rupees were at stake. I remember the times when the issue of “Shama” Urdu monthly, the most sought after, had its circulation into lakhs, in fact more than a newspaper, like, “The Times of India” or the weekly, like, “The Illustrated Weekly”, as told to me by Yunus, when I had interviewed him some two years ago just before he was struck by a stroke. In fact, special flights were booked for transporting “Shama” and “Khilauna” to London, Karachi and New York and the three brothers — Yunus, Ilyas and Idrees — used to accompany. The duty of Yunus was on the Air India or PIA Karachi sector. Top film actors like Dileep Kumar, Ashok Kumar, Raj Kapoor, Asha Parekh, Nutan, Nargis, Raj Kumar, Sanjeev Kumar, Mohammed Rafi, Malika Pukhraj and many more used to frequent Yunus’ mansion at Sardar Patel Marg, now bought by politician, Mayawati. Started by his father, Haji Yusuf Dehlvi, Yunus ran the world’s biggest chain of these Urdu magazines from 1943 till 1994 after the family fragmented and the historic era of these publications got sacrificed at the altar of children and grandchildren’s egos. To be frank, I have learnt my Urdu from the magazines mentioned above and especially, “Khilauna”. Several old fans of “Khilauna”, today in their middle or old age, rummage “raddi” (scrap) shops or old bookshops from Karachi to Delhi and Lahore to Mumbai in search of it but in vain. Even in the libraries, these are not available. Fortunately, I have some 100 copies of the magazine from 1946 till 1987. Several old fans of “Khilauna”, today in their middle or old age, rummage “raddi” (scrap) shops or old bookshops from Karachi to Delhi and Lahore to Mumbai in search of it. Syed Faisal Ali, the editor of the Urdu daily “Sach ki Awaz” manages from his resources to get the old issues of “Khilauna” and reads these to relieve stress, “You escape back into your childhood, when you didn't have a care in the world.” What was once a household name in the comity of children’s Urdu monthlies has become a collector’s item post its shut down. “The craze for 'Khilauna' is keener among the older bunch,” Prof Akhtarul Wasey said, adding smugly that the old magazines always sold ‘at a premium’. However, these are just extinct now. 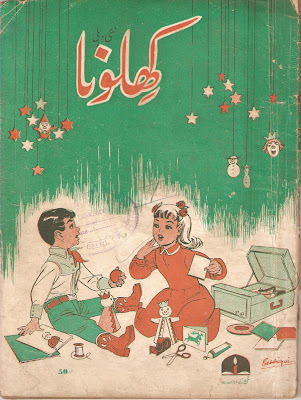 “Khilauna”, a collection of Urdu culture and heritage, had carved its niche through stories, poems, cartoons, comic strips like — “Nanhi Munni Kahaniyan” (a column for young writers), “Hamara Akhbar” (newspaper clippings), “Suraj Ka Bahadur Beta Shamsi” (serial pictorial story), “Muskurahatein” (jokes), “Hamarey Naam” (letters from readers), “Batao To Bhala” (Readers’ Questions and Answers), and much more. Renowned Urdu poets and writers of the time -- like Khwaja Ahmed Abbas, Hafeez Jalandhari, Hasrat Jaipuri, Qateel Shifai, Ismat Chughtai, Salam Machhli Shehri, Razia Sajjad Zaheer, Krishan Chander, Raja Mehdi Ali Khan, Balwant Singh, Kanhaiya Lal Kapoor, Ram Pal, Sahir Ludhianavi, Ram Lal, Siraj Anwar, Basheshar Pradeep, Shafiuddin Naiyar, Kaif Ahmed Siddiqui, Dr Kewal Dhir, KP Saxena, Azhar Afsar, Prakash Pandit, Aadil Rasheed, MM Rajinder, Jilani Bano, Naresh Kumar Shad, Abrar Mohsin, Masooda Hayat, Ishrat Rehmani, Abrar Mohsin, Khaliq Anjum Ashrafi -- besides many others used to be household names from 1940 to 1990s. The “Shama” and its sister publications will never be forgotten as the connoisseurs of best Urdu literature won’t forget Yunus Dehlvi.